Now, more and more mac users switch to iWork suits to deal with files, due to its simplicity and beauty. And we may run into similar situations mentioned above. To recover a deleted or unsaved Numbers spreadsheet on Mac or on iPad/iPhone, we here list 5 ways to get the problem solved. 1. How to Recover Deleted Numbers File on Mac or iPad? 2. How to Recover Unsaved Numbers Spreadsheet on Mac? How to Recover Deleted Numbers File on Mac or iPad? There are 3 ways to recover a deleted Numbers file on Mac or iPad respectively, using a professional data recovery software or without any software installed. Turning to an expert is always the most efficient way to get your deleted Numbers files back, no matter on Mac or on iOS device. Cisdem Data Recovery for Mac is a dedicated program to recover all kinds of files from internal or external storage device, such as iWork Numbers, Pages, Keynote, videos, photos, audios and other files. Why Cisdem for Numbers Recovery? Step 1Download and install Cisdem Data Recovery on your mac, then launch it. Step 2Select a recovery mode. 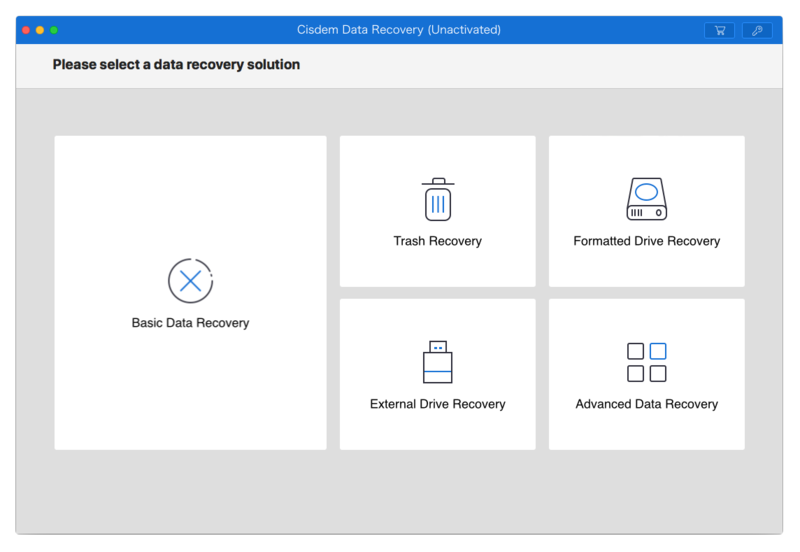 Cisdem offers 5 recovery modes: Basic, Trash, External Device, Formatted Drive and Advanced. 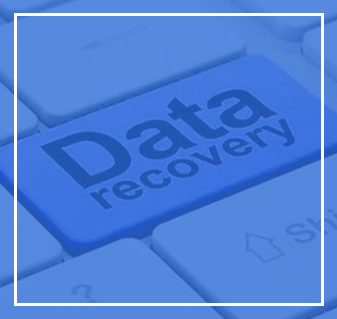 You can select according to your need, or start with the Basic Data Recovery to recover fast and well. Step 3Choose the storage device to scan deleted Numbers file on mac. Select the device where your deleted Numbers files are original saved, then click “Scan” to start finding them out. Step 4Preview and recover Numbers spreadsheet on mac. 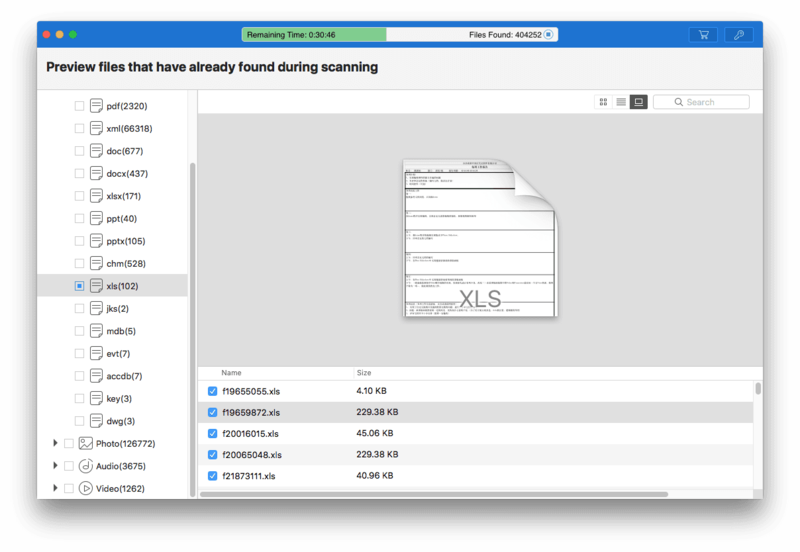 Once the scanning finishes, all the found files will be categorized in different folders, find your deleted files, preview, then click “Recover” button to get the Numbers file back. Dr.fone is an iOS data recovery to recover files from iPad or iPhone on mac, including photos, videos, contacts, messages, notes, call logs and app documents. There are 3 recovery modes, recover directly from iPad, from iTunes or iCloud backups. Though working as an iOS data recovery tool, there is only PC version available, users need to install and run the software on computer, then connect iPad or iPhone to computer for data recovery. Choose a recovery mode, from iOS device, iTune backup or iCloud backup. Then click “Scan” to find the Numbers files. Select the documents and click “Recover to Computer” to restore the files onto your computer. It is recommended to recover a permanently deleted Numbers file on mac with professional data recovery software, but if your files are not permanently removed from your Mac or iPad/iPhone, you can find them back in Trash bin. As we all know, when we delete a file on mac, the file is just moved to the Trash bin, it is still there on our mac. 1. Go to Trash bin. 2. Click on the following toolbar to find your Numbers file by name, kind, date or others. 3. 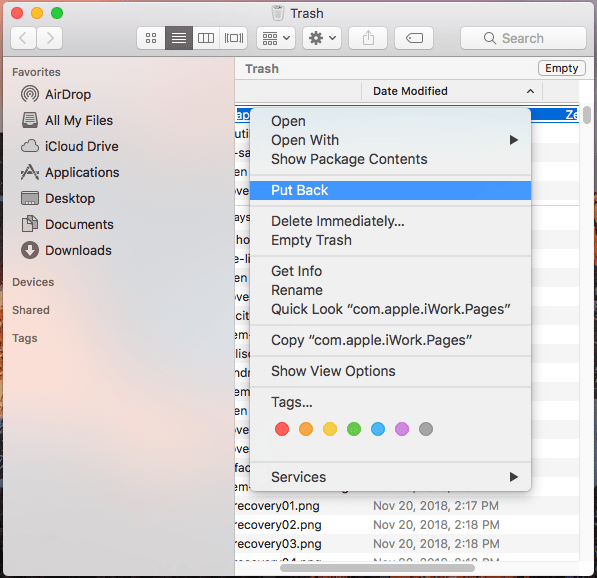 Right click on the file, choose “Put Back” to recover Numbers file from your Mac Trash bin. 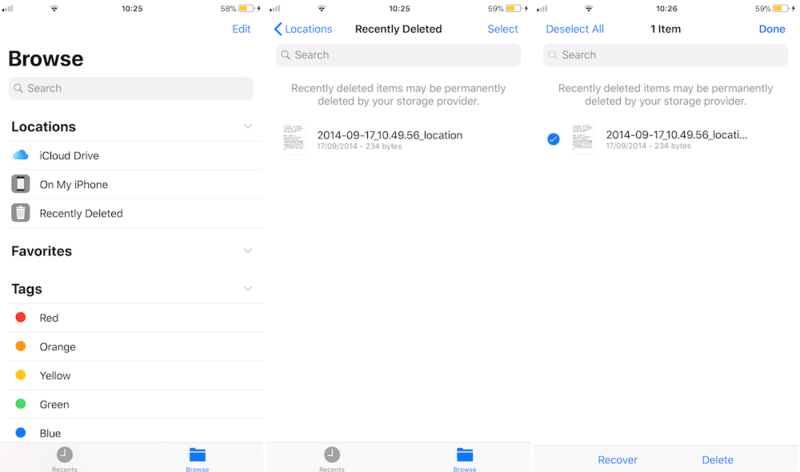 On iPad or iPhone, there is no Trash bin available for us to store the removed files, but the application---Numbers for iPad itself provides the space to store deleted files for some time. 1. Open Numbers on iPad. 2. Tap “Document” and find the “Location list” in the left column. 4. Tap “Select” to choose the deleted Numbers file you want to recover, then tap “Recover” to restore the deleted Numbers Spreadsheet on iPad. 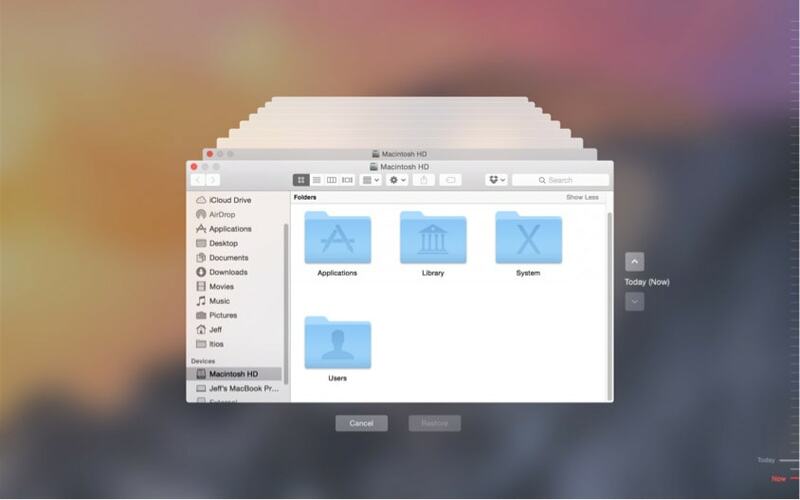 iCloud is a great program to store all kinds of files, allowing users to access to and manage files across different Apple device. 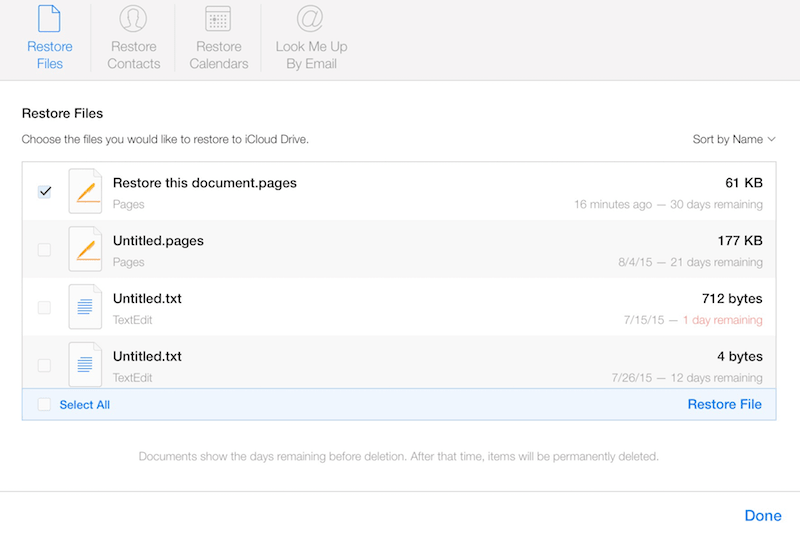 Also, you can recover deleted Numbers file from iCloud both on Mac or iPad/iPhone. 1. Login into your iCloud account or go to iCloud website on Mac. 3. Then all the deleted files will be showed, select the deleted Numbers file you want to recover. 4. Click “Restore” to recover the deleted Numbers spreadsheet on Mac or iPad. We may accidentally delete or lose a Keynote Presentation. No worries, we are going to show how to recover deleted, formatted, unsaved Keynote presentation. How to Recover Unsaved Numbers Spreadsheet on Mac? Sometime, where we were editing a Numbers file on Mac, the program may be crashed for no reason or Numbers file was closed and left unsaved on mac due to sudden power-off. In this case, we will use 2 ways to recover an unsaved Numbers spreadsheet on mac. As you may have heard, MacOS comes with a powerful feature called AutoSave, helping users to auto save the documents under editing. This feature works particularly perfect on saving Apple-proprietary documents, such as Preview files, iWork files, etc., which includes Numbers spreadsheet. By default, this AutoSave feature is ON, you can go to System Preferences>General, check if the box before “Ask to keep changes when closing documents” is checked or unchecked. If unchecked, the AutoSave feature is ON. 1. Find a Numbers document, right click to open with iWork Numbers. 2. Then all the Numbers files you left unsaved are opened, choose the one you want to restore, click save to recover the unsaved Numbers document. 3. In the case you don’t find the unsaved Numbers file, go to File>Open Recent, then save the file. If you still cannot find the unsaved Numbers file back, you will need to check if the file is saved in Temporary Folder. 2. Run Terminal on your mac. 3. 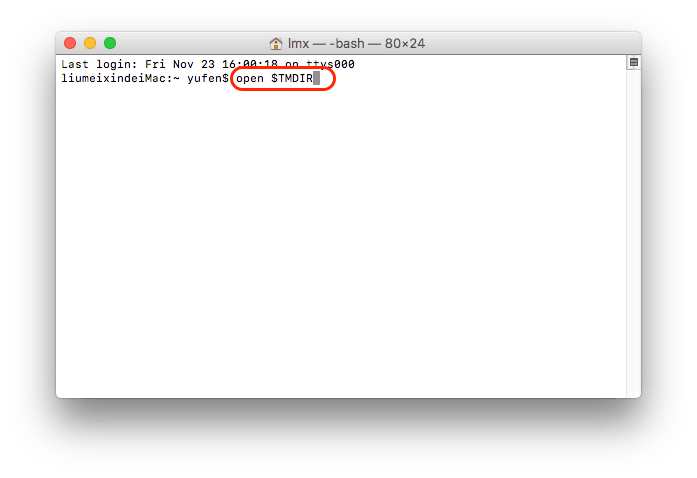 Input “open $TMPDIR” in Terminal, then press “Enter”. 4. 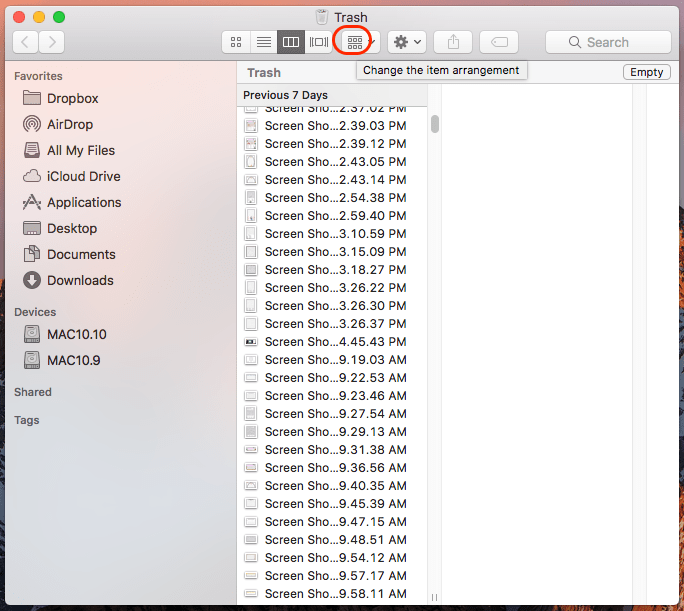 Find the Numbers document you leave unsaved on mac, then open and save the file. In the case you want to restore a previous version of Numbers spreadsheet, here are 2 solutions. But it is much easier and convenient to do this on a Mac than that on iPad or iPad, since MacOS allows users to utilize its Time Machine to revert to earlier versions of a specific file. Time Machine is the MacOS utility helping users to back up files onto external hard drive and restore if necessary. This solution is not only used to recover deleted or lost files from Time Machine backup, but also used to restore previous version of Numbers file from Time Machine backup. 4. Click “Restore” to restore the previous or earlier version of Numbers file on your mac. There is another easy way to go back to an earlier version of Numbers file. The app of Numbers for Mac or Numbers for iPad itself can revert to a previous version. 1. Run Numbers app on your mac or iPad. 2. Go to File>Revert To, browser the previous versions. 3. Select your preferred version and save the file. 2. Tap Select, then check the Numbers spreadsheet. 4. Directly save the copy, or tap Restore to replace with the currently previewed file, or tap Close to turn to the current version. 5. Tap Done, you will get an earlier version of your Numbers file. So, as you can see, even though we accidentally delete or lost a Numbers file, there are professional and free data recovery tools to get them back, even it is possible to restore an unsaved Numbers file. But as always, the best way is finding an expert, such as Cisdem Data Recovery.